Bring 2 cups of water to the boil and add the onions, beans, radish and banana. Simmer for 3 minutes. 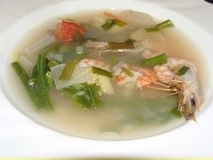 Add the shrimp and simmer two Minutes. Add the tomato, rice, fish sauce, lemon juice and pepper and salt to taste. Cook the potatoes 15 minutes and puree them with the beets and salt to taste. Add 2 cups of water. Reheat. In the meantime, melt the butter and add the onions and the cornstarch, stir well. Add the milk and bring to the boil while stirring. Mix in the potato mixture. Serve sprinkled with cheese. 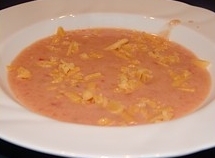 There are many recipes for potato soup, and the soup is popular in many countries. 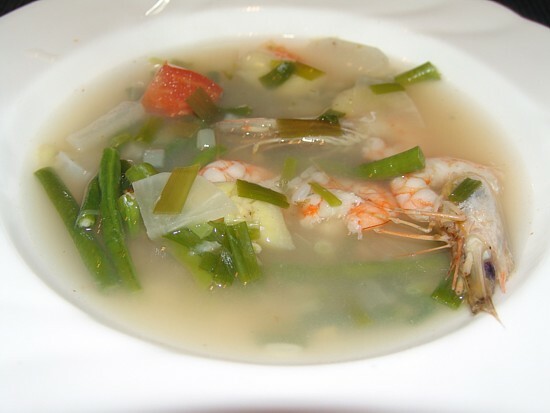 The Worldcook site has not only this Dominican soup, but also recipes for Tibetan, Danish an German potato soup.